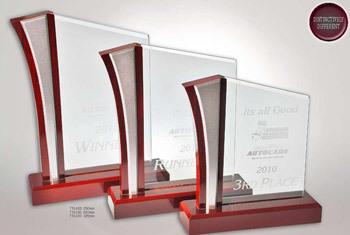 Reward achievements and success with these latest modern Awards. 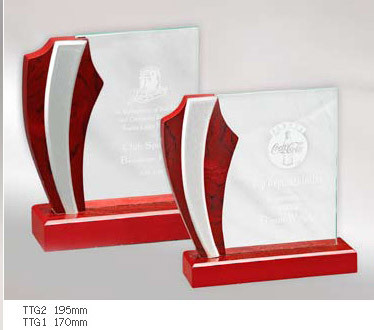 Individually Crafted which can be customized and engraved with your logo and text. Rectangular Glass in Rosewood coloured Wooden stand. Engraving can be done on glass as well as base. Comes in 3 sizes 195, 220 & 250mm. Priced very reasonably. Rectangular Glass in Rosewood coloured Wooden stand. Engraving can be done on glass as well as base. Comes in 2 sizes 170, & 195mm. Great Value for money. Ideal trophy for Winner & Runner up. Optical Crystal with Shiny metal Star. Available in 2 sizes 190mm & 205mm. 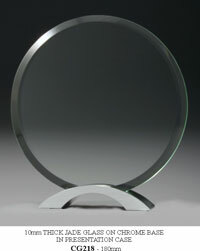 Optical Crystal can be laser engraved or sandblasted. Presented in Satin Lined Gift box. The STAR of the Show. Optical Crystal and Chrome Arch. Available in 2 sizes 190mm & 230mm. Fully laser engraveable. Presented in Quality Gift box.